Welcome to P90X3 Pilates X. Like yoga in the original P90X, Pilates X may be an introduction into Pilates for many of you. Although it may be very difficult and frustrating for many of you are first, give it some time and allow yourself to improve over time with this one. This routine will be tough for a lot of people because it targets some weak areas of the body in a large portion of the population. This routine is all about core activation and control. Like Isometrix, this routine is zero impact, so it is a great routine to allow the joints and ligaments to recover a bit, especially after all of that jumping around and muscle pumping you do on your other working days. The nature of the P90X3 workouts is to obviously keep things short and maintain that 30 minute time crunch. Unfortunately for a routine like Pilates X, it doesn't allow much room for instruction. This routine moves very quickly, and besides a few quick breathing cues at the beginning, most people are going to be struggling through this one the first few or several times, trying to pick up on the breathing technique and/or the movements and postures. 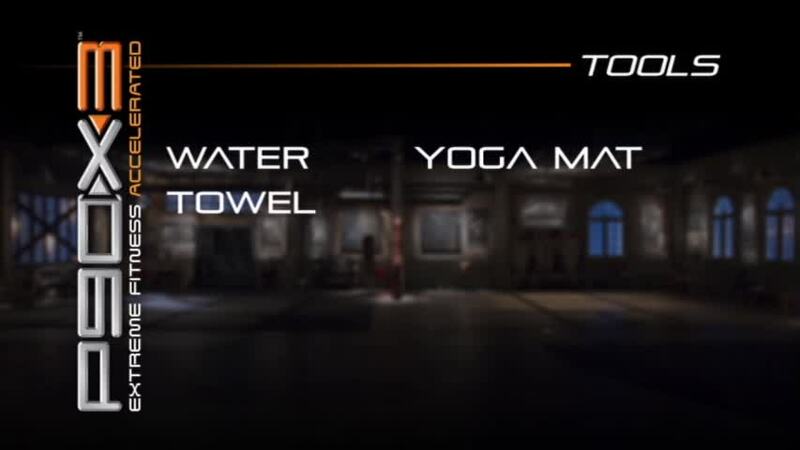 As I stated in the intro, this routine will be a challenge for those of you who are not very flexible. Don't worry, the routine is definitely do-able, but be forewarned that some of the movements and sequences are extremely tough to muster if you lack flexibility. The first 15 to 20 minutes of this routine I, personally, did not find all that difficult. It even had me worried that I was even doing things correctly. After reviewing my video later, I realized that my form was pretty good and that the first 20 minutes just weren't that difficult for me. The last 10 minutes, on the other hand, really challenged me. Some of the side plank exercises, with movement, really fired up my muscles and I was heating up rather nicely. If you are familiar with Pilates and/or have great flexibility and hip mobility, then you may not find this routine to be all the challenging. The last 10 minutes of the routine definitely holds the toughest sequences though. If you have a weak core (core, not just your abs) or lack in the flexibility department, then I think you may struggle here. There are 22 exercises in total. The first couple really are about stretching and learning how to control your breath. Most exercises are done for a repetition count, some are timed exercises. This routine moves at a very quick pace to get all 22 exercises done in 30 minutes. As I have stated previously, the lack of instruction is definitely a problem in this one. I realize that they for the most part, the teaching has to be reduced in order to maintain a time constraint, but a separate instructional video, even with 15 minutes of tips and advice to help us newbies would have been great. The exercises themselves are rather straightforward. You will find some tough ones towards the end. Exercises that you probably haven't see before. There shouldn't be anything here that you can't coordinate yourself too, however. It is hard for me to try and comment or give advice on a Pilates routine since this has been the first time I have done an entire Pilates routine. I am not a Pilates instructor, I have dabbled with some Pilates exercises in the past, with my clients as well as with Beachbody workouts and can appreciate the benefits that they hold. I will say that what I have felt has helped me is working on my flexibility, especially my hip mobility. If you are not very flexible, especially through your hips, hamstrings, and lower back, this routine will make you struggle much more than you probably would have hoped for. I was never one to focus on flexibility when I was younger, and I believe that probably played a part in my back injury years ago. Since then, I consciously focus on trying to improve my flexibility on a daily basis, always trying to not only maintain flexibility, but also improve it too. Also, don't discount the breathing patterns they teach you in the video. It is easy to discount this because it "sounds silly" or makes you feel like you are giving birth, but there is a method to this madness so just do it! I definitely think it was a good attempt by Beachbody and Tony to try and include this routine in X3. It is clear that this routine is beneficial and can work on trouble areas for a lot of people, however, I personally don't see this one making its way into my usual workout routine library in the future. I have a feeling this routine will end up like Yoga X from P90X. X3, like P90X, is a great overall program, even though it has a routine or two that is not for everybody. Some folks will love this one, I am personally not a big fan. How important is protein timing?